A perfectly sunny and calm day greeted the 38 Hobie 16?s taking part in the 2013 Boardwalk Hobie 16 National Championships today. The Boardwalk Hobie 16 National Championships are being sailed off of Hobie Beach, Port Elizabeth from Thursday 22nd to Sunday 25th March 2013. 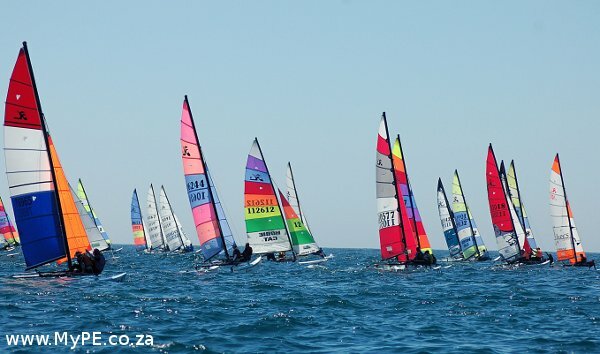 Thanks to local sponsorship the Hobie 16 Nationals will be sailed in Algoa Bay every year until 2016. In the light South-Easterly of 6 to 8 knots, Race Officer Doug Allison, set a Windward Leeward (Sausage shape) course with the start in line with Shark Rock Pier, the top mark in line with Admiralty Way and the bottom marks in line with Humewood beach – a perfect spectators course which presented the Hobies with the choice of staying inshore and sailing close to Bird Rock on their way up to the first rounding mark. The Hobies were allocated a course which would see them sail twice around the top and bottom marks before finishing. 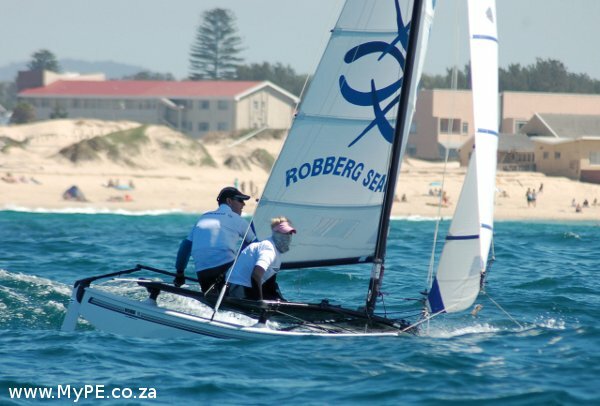 First around the top mark was the Plettenberg Bay duo of Blaine and Roxanne Dodds, eager to stamp their authority on the regatta and avenge their 2nd place of 2012, they were followed by local husband and wife sailors Andrew and Angela Ward who have been training and dieting up a storm in preparation for these nationals. From the top mark a downwind leg saw many of the boats opt to hug the shoreline looking for a land breeze before taking the outermost gate buoy on the bottom gate mark before the long march back up the beat for the top mark. Most Hobies opted to hug the shore line and dodge Bird Rock on the return back up to the top. An increasing wind velocity and wind shift greeted the back markers as the predicted increase in wind velocity and shift made it’s appearance. Most of the back markers completed the last leg to the finish on a reach. With the wind increasing to 28 knots some Hobies were seen to capsize and the rescue boats stood by. The top three finishers were: 1. Blaine and Roxanne Dodds 2. William and Lucinda Edwards 3. Andrew and Angela Ward (unofficial results). As a safety precaution, Race Officer Doug Allison, sent the Hobies back to the beach to wait out the big westerly blow and eventually abandoned racing. 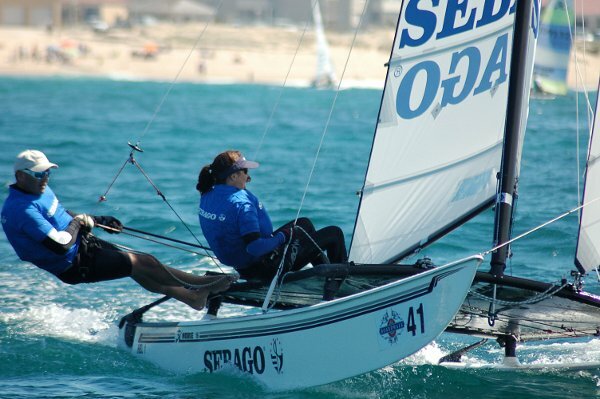 Racing begins again on Friday 23 March 2013 off Hobie Beach at around 10:00 am.